I have a fascination for Italy’s borghi: quaint little villages with an interesting history and architecture, where time seems to have stopped. Whenever I travel to an Italian region, I look up what borghi are nearby so I can always discover new ones (there are plenty of them all over Italy). Here’s my pick for three favorite borghi, from the north, center and south of Italy! I visited the medieval village of Chiusa last Fall, while I was hiking the Chestnut Trail in the gorgeous Isarco Valley. 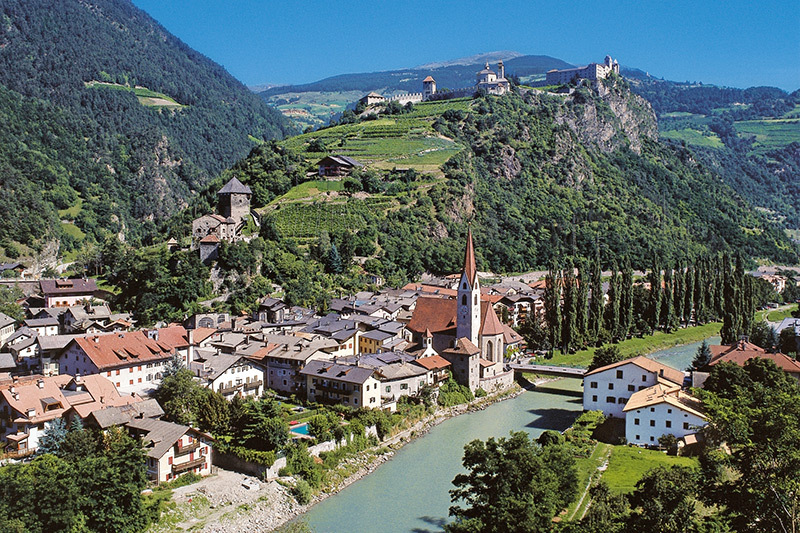 Located 30 km northeast of Bolzano, surrounded by chestnut forests and vineyards, Chiusa is a romantic, medieval village flanked by a river, with picturesque alleys and lovely houses of crenellated facades. Chiusa, which means 'closed' in Italian, takes its name from the narrow natural passage that embraces the little town between the cliff of Sabiona, the Isarco river and the Tinne stream – an amazing backdrop. Chiusa is divided into Città Alta (Upper Town) and Città Bassa (Lower Town). Most houses in the Città Alta are very narrow, therefore they tend to develop horizontally. Walk behind them to admire their balconies decorated with colorful flowers, overlooking the river – a great view. Città Alta ends at Piazza Parrocchia; notable here is the Church of Sant’Andrea, a late Gothic structure (1482-98) built over the remains of a previous Romanesque building, considered one of the most beautiful Gothic churches in South Tyrol. From the piazza, walk toward the Città Bassa, where you can admire the beautiful signs of the old inns. The small picturesque streets are named after old trades and crafts. Among the most significant buildings here are the former Orso Grigio hotel, the oldest inn in town (mentioned in 1335), and the Caffè Nussbaumer, which, during the heyday of Chiusa artists’ colony, housed a special Artists Room (Künstlerstübele), set up with a unique art gallery. Between the 19th and 20th centuries, Chiusa became home to many artists, coming especially from Germany, which is why the town is also known as the ‘city of artists’, and still has a bohemian feel to it. Even before then, Renaissance artist Albrecht Durer spent time in Chiusa in 1494 to portray this town he was so fond of. A rock called “Duererstein” marks the place where he realized the copper engraving “Good Fortune”. Città Bassa ends at Piazza Tinne, picturesquely framed by old hotels, some of which are still operating. Between 800 and 1,000, the monastery of Sabiona, which overlooks the town from an imposing cliff, became an important bishop’s seat. Today, it represents one of the most ancient pilgrimage sites in South Tyrol. Walk the old path of the Stations of the Cross for a steep 30-minute climb up to the monastery - the view is just spectacular. Monteriggioni is a medieval walled town, sitting on top of a hill overlooking the beautiful Tuscan countryside, between Siena and Colle Val D’Elsa, originally built as a castle. Park your car at the bottom of the hill (parking lot available) and enter the village from the Porta Fiorentina (facing Florence to the north) or Porta Romana (facing Rome to the south). The main street within the walls connects the two gates in an almost straight line. 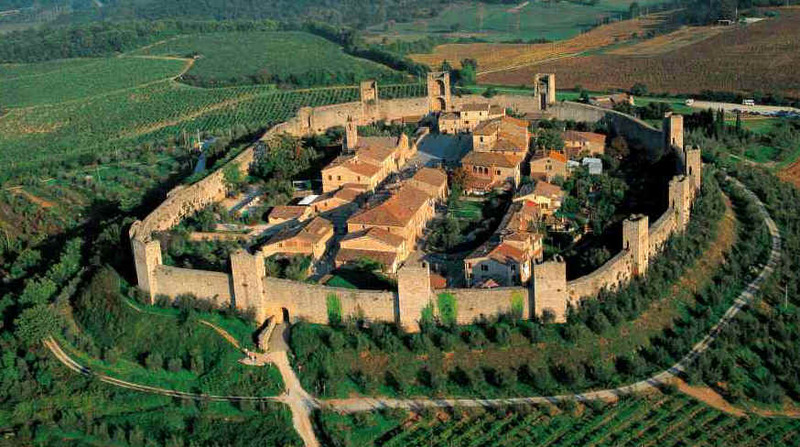 The castle of Monteriggioni was built by the Sienese in 1214-19 during the wars with Florence because of its strategic position overlooking the Cassia Road. This way the Sienese were able to control the cities of the Val d’Elsa and Staggia and be on the lookout for any armies approaching Siena. The well-preserved 570-meter-long circular walls, featuring 14 towers set at equidistance from each other, follow the natural curve of the hill. You can walk along two stretches of the walls for great views of the Tuscan countryside and of the town, especially the main piazza, Piazza Roma. On the square is the Romanesque church of Santa Maria Assunta, pretty Renaissance-style houses once owned by the local nobles, several cafès and restaurants (impressively good and reasonably priced for being in a very touristy location). Browse the stores along and off the main street for local honey, ceramics, jewelry and more. I visited Cefalù, on the northern coast of Sicily, during the Sherbeth Festival, an annual event celebrating gelato, when the town was taken over by gelato stands and gelato artisans from all over the world. 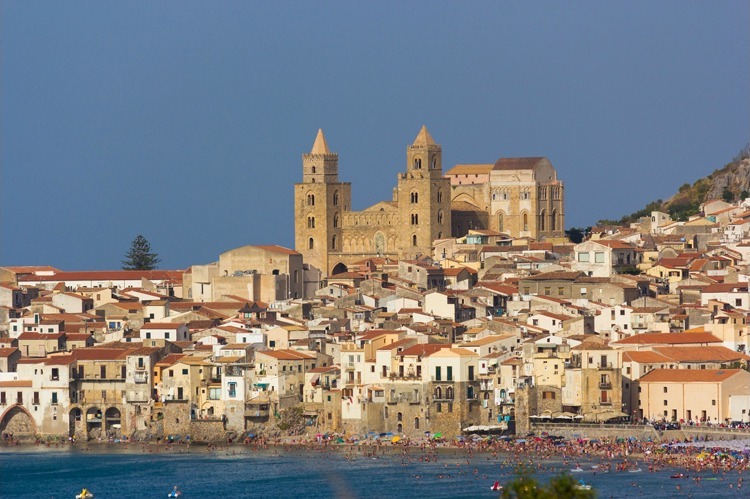 Called Kephaloidion by the Greeks who founded it, Cefalù derives its name, which means "headland," from its position jutting out of a promontory, with a rock (La Rocca) towering over it. In 858, Cefalù was conquered by the Arabs, who renamed it Gafludi, “a fortified town with abundant water”. They built their citadel over La Rocca, occupying it until 1063, when Cefalù was seized by the Normans. A 30-minute climb up the Salita Saraceno takes you to the top of the Rock for great views of the town below. In 1131, Roger II, King of Sicily, began construction of what is today the main attraction of this borgo by the sea: the Cathedral. It is thought that he built this imposing church, fortress-like in its aspect, so far from Palermo, the capital of his kingdom, as a reminder of his power across the island. The church was also destined to become his mausoleum. The building, evocatively placed between mountain and sea, is a wonderful mix of three cultures: a Norman style temple with Byzantine mosaics, designed and built by Islamic architects and workers. Make sure you go inside to admire the massive Christ Pantocrator in the apse, made of mosaic with a gold background by Byzantine artists, with inscriptions in Greek and Latin. Other main sites in Cefalù include the Baroque Monte della Pietà and Church of Purgatorio, the medieval washhouse, at the mouth of the Cefalino river, carved entirely out of rock, and the Mandralisca Museum, housing the remarkable Portrait of an Unknown Man (1465-70) by Antonello da Messina. Take your time just wandering among Cefalù's tiny narrow streets, discovering hidden corners and small squares; enjoy a passeggiata along the main street, Corso Ruggero, and sit in Piazza del Duomo while sipping granita al caffè con panna. Perhaps the best way to end your tour of Cefalù is at the old port, a fascinating sight, especially at sunset, with its fishing boats and fishermen mending their nets.